Oliver O. Howard served with distinction during the Civil War, losing his right arm at the Battle of Fair Oaks. Despite his disability, he returned to the war. During Reconstruction, Howard, who was deeply concerned about the fate of some four million freed slaves, was named to head the Freedman’s Bureau, the federal agency charged with ensuring the former slaves’ welfare and integration into society. Howard’s chief accomplishment was the establishment of schools and vocational training institutes under the auspices of the bureau. He was also a founder in 1867 of what became the nation’s premier institution of higher education for African Americans, Howard University, which was named in his honor. 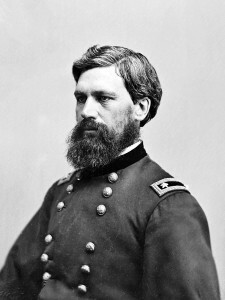 Howard served as the university’s third president from 1869 to 1874, when he returned to military service as a general officer in the Indian Wars of the West.